Shisaku: What Has Been The Abe Cabinet's *Real* Popularity? 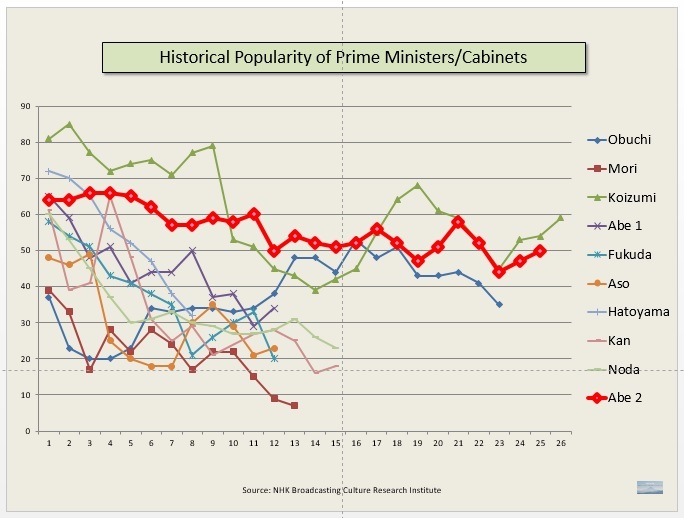 What Has Been The Abe Cabinet's *Real* Popularity? A week ago my good friend Dr. Paul Scalise made an effort to provide some perspective on the danger Prime Minister Abe Shinzo may be in following a recent significant loss of public support. The many hours of Diet debate preceding the votes for the collective security bills saw the PM and his allies making a bonfire of his political capital, with his poll numbers heading south as an immediate consequence. Dr. Scalise argues that despite the conflagration, Abe himself is in no danger. As compared to his predecessors, he is still enjoying significant levels of popularity, at least as measured by voter support for his Cabinet. The graphs below, which Dr. Scalise first posted to Facebook, have been since been shared by Professor Daniel Aldrich on Twitter. I hope that reposting Dr. Aldrich's tweets causes Dr. Scalise no heartburn. Dr. Scalise argues that despite all the supposed public rage at the collective security legislation, other repressive legislation like the Designated Secrets Act, public unease at the restart of nuclear power plants and the typhoon of contempt in response to the abandonment of the National Stadium's design, Abe is nevertheless sitting pretty as compared to even the illustrious Koizumi. One can quibble on the details, noting that Dr. Scalise's graphs do not contain the latest information from Nikkei. Not surprising, really: the latest Nikkei poll was not published until the 27th. In its latest polling Nikkei found that the percentage of voters saying they support the Abe Cabinet fell in July to 38%, while the Do Not Support percentage rose to 50%. This lacerates the Abe Cabinet with its first net negative rating of -12%. (Link - J). So the black line in the graph immediately above should be diving below the 40% line, into sub-Koizumi territory. The big knobbly red line is Abe 2.0's support ratings as measured by NHK's national poll. As indicated, Abe's record as of 25 months in office compares very favorably with the records of other prime ministers, including that of The Great One (green line with triangles). The part of the argument I do not buy is that Abe need not worry much about his recent losses of popularity. That is probably NOT true -- Abe is in significant trouble, significantly more than the raw numbers indicate. The reason for this is simple: Abe has not had any competition. Since his victory in the September 2012 race for the presidency of Liberal Democratic Party, Abe has enjoyed the ahistorical evaporation of the political capital of every single intra-party challenger to his position. Most of the time this was a result of exquisitely poisonous personnel management, such as appointing Ishihara Nobuteru to the Environment portfolio, giving Ishihara direct responsibility over the cleanup at Fukushima Daichi nuclear power station. In a few instances chance intervened, such as in the case of the stroke and recent decease of Abe's former faction boss Machimura Nobutaka. 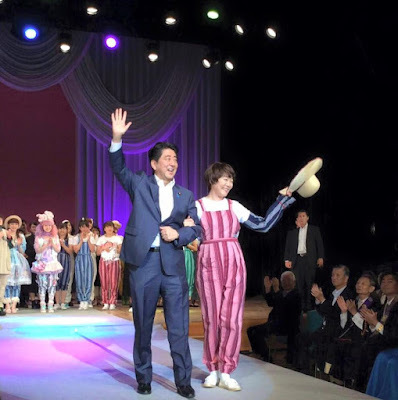 In any case, Abe has none of the rival claimants to the LDP throne of a normal LDP leader. Abe has been further blessed by the absence of a credible opposition to the LDP. The opposition vote has been until recently split between the Democratic Party of Japan, the Renovation-Restoration-Innovation complex of Hashimoto Toru and the Your Party vanity project of Watanabe Yoshimi. Even after the crack ups of these two latter political movements and the realignment of their remnants with the DPJ, voter support for opposition parties adds up to less than half the voters support for Abe's LDP. The percentage of voters saying they are supporters of the LDP has, indeed, been at record highs. Those highlighted words should set red lights to flashing. If the debased LDP of today is more popular than the LDP of the party's golden years of pork and economic advancement, then one has to wonder the depth and stability of this support. Indeed in the most recent Kyodo poll of July 16-17, support for the LDP fell 5 percentage points from a month before, from 37% to 31.9%. Most of the loss of support flowed into the floating voters pool (39.3%) rather than into the columns of any of the opposition parties. Nevertheless 5% is a huge chunk of support to lose in a month -- and the Kyodo poll was taken before Abe's dramatic and wounding decision to dump the Zaha Hadid-design for the National Stadium. Abe Cabinet and LDP support numbers are displaying significant volatility; Abe lacks intra-party rivals or a muscular opposition. Comparing Abe's popularity versus the popularity of other prime ministers, given the vast differences in the political environment in which they operated versus the one in which Abe operates, may be a comparison of apples and oranges. So perhaps we should be playing around with the concepts of "real" versus "nominal" support for the Abe Cabinet. A lack of alternatives may make Abe seem more attractive or be more attractive than he would be had the voters had credible options. Abe's numbers in this second term in office may be, in other words, inflated as compared to those of his predecessors. Source: Kyodo News poll of July 17-18. Stunning, would you not agree? 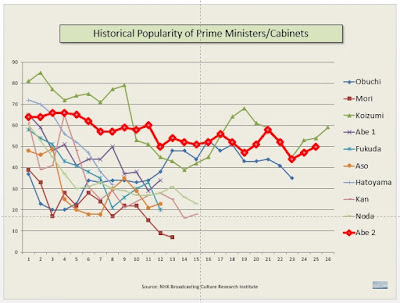 You would probably not be surprised to learn that until the Abe 2.0 Cabinet the response "There is no other appropriate person" has never been the #1 reason for supporting a PM, much less #1 by a more than two-to-one margin. The implication must be that Abe's nominal support numbers are not just out of whack, they are seriously out of whack. So what is to be done, if we are to assess to the level of danger Abe may be in? One possibility is to raise the "line of death" for the premiership. Under previous regimes, the line has been around 20% support. Only one prime minister of recent vintage, Obuchi Keizo, managed to pull up and stay in power after approaching the 20% line (see my graph above). A death line reading of 20% is overly generous to Abe. A "political death" line of 30% might be more appropriate, given the volatility of support from what would be otherwise floating voters or voters for a credible opposition. If so, then popularity readings of around 38% should be setting off sirens inside the LDP. An alternative approach would be to deflate Abe's numbers overall, shifting his nominal curve downward for the length of his tenure. By how much? Based upon the difference between the 31.4% saying "there is no other appropriate person" and the percentages of voters choosing that option for previous prime ministers (a number that can be double-checked across time, since the answer to the "why do you support the PM?" question are compiled the same way in every iteration of a single media source's polling) a knockdown of 10 percentage points does not seem outlandish. Whatever the method used, we need to get "real" about voter support for Abe. Positing "real" versus "nominal" rates of support for Abe solves a particular vexing problem, the one I have been calling The Abe Paradox. In poll after poll, the Abe Cabinet's support ratings have been higher than voter support for the Cabinet's major policy thrusts. This is clearly impossible -- a Cabinet cannot be more popular than any and all of its policies -- unless that Cabinet support number itself is unreal. By reassessing the Cabinet support ratings for Abe as being nominal support as opposed to real, the Abe Paradox disappears. Cabinet support numbers are inflated by a lack of competition. They can consequently float up above support for Cabinet policies. Questions on policy, however, are bounded by reality -- i.e., the poll gives respondents at least the choice of the negative "I do not support the Cabinet's policy." Image source: Abe Shinzo's Official Facebook Page.